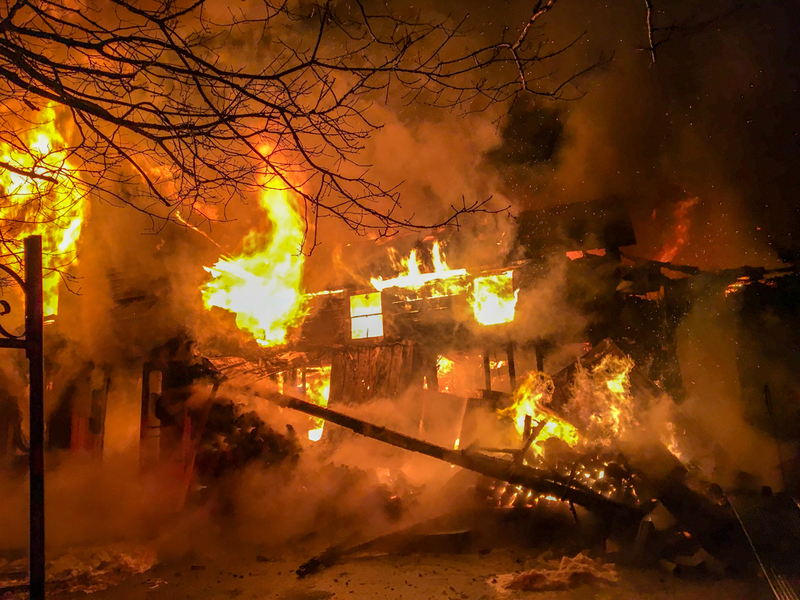 GOSHEN, MA– Firefighters from Goshen, Chesterfield and Williamsburg along with a crew from Highland Ambulance were simultaneously called to a reported structure fire at 164 Berkshire Trail West (Route 9) in the Lithia section of town at 2238 hours Friday night. The house, built in the mid-1800’s, was the ancestral home of the Judd family and was currently occupied by Phil and Jess Judd along with their 4 young boys. The family was sleeping when they were alerted to the fire by a smoke detector located at the top of the second-floor stairs. When Phil went to investigate the sound of a stranger’s voice in his house, he could already see flames at the base of the stairs near the wood stove right below the boy’s bedroom. Phil and Jess were able to safely escape through the flames with only the clothes they were wearing. They raced a short distance up the street to Phil’s parents’ house to call 911. Smoke from the fire was apparent long before responding units reached the scene. 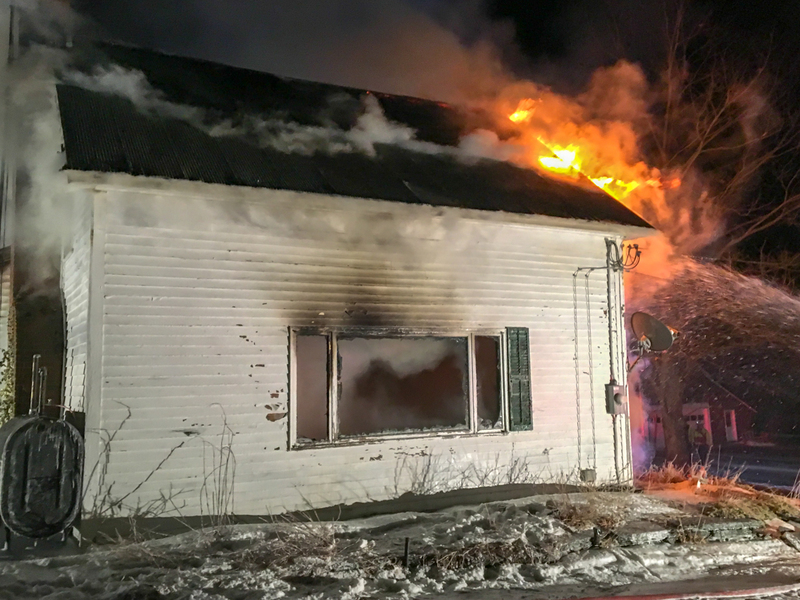 Upon arrival, fire had already burned through the roof near the chimney and was pouring out of several windows on the eastern side of the house. A second alarm was struck for additional units and manpower. A tanker shuttle was established by those resources which brought water from the nearby Swift River to two dump tanks that were placed on Route 9 in front of the home as family watched from across the street. A truck from National Grid was dispatched and arrived a short time later to cut power to the structure while firefighters battled the blaze. Route 9 was closed down in both directions by Goshen and MA State police to give crews valuable room to work. During the exterior attack, hose lines were stretched to every side of the building as firefighters worked to contain the spreading flames. As the fire progressed, firefighters kept a watchful eye on both chimneys while several sections of the building collapsed. 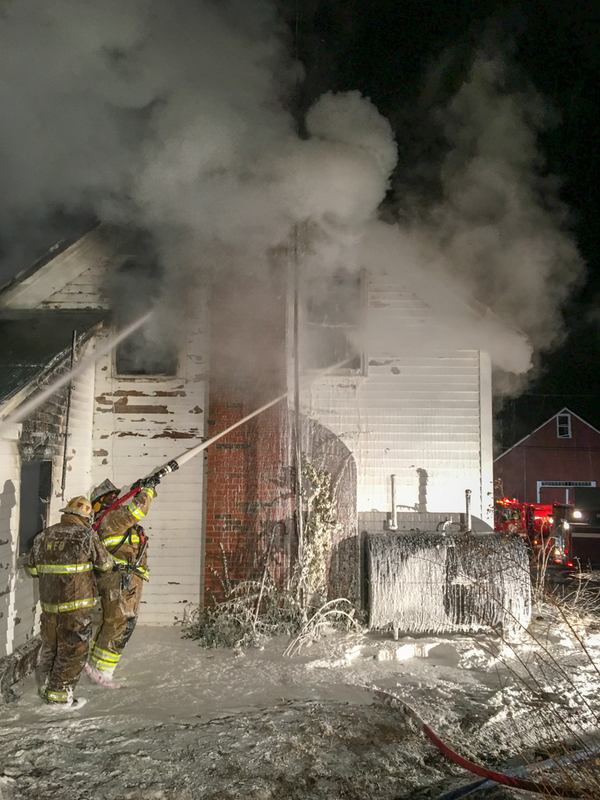 Temperatures in the low to mid-teens brought icy conditions to the fireground. 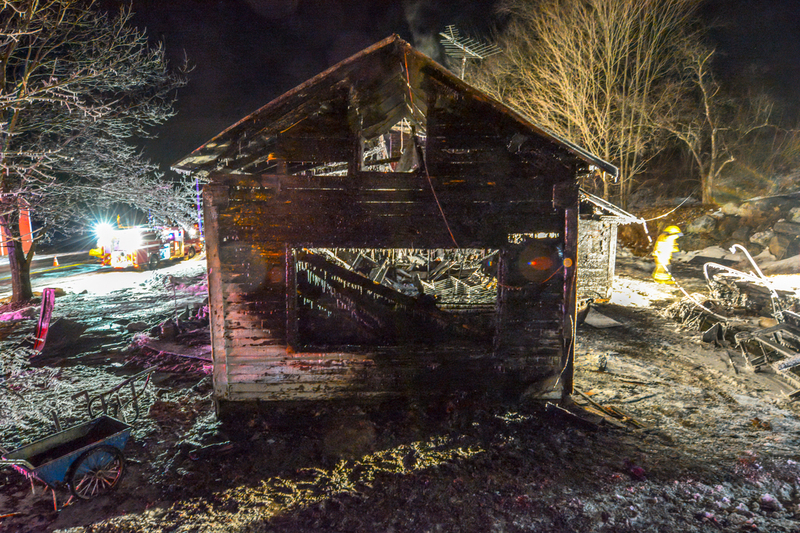 Several pieces of apparatus were forced out of service due to the freezing temperatures. Workers from the MA D.O.T. kept Route 9 sanded during operations. 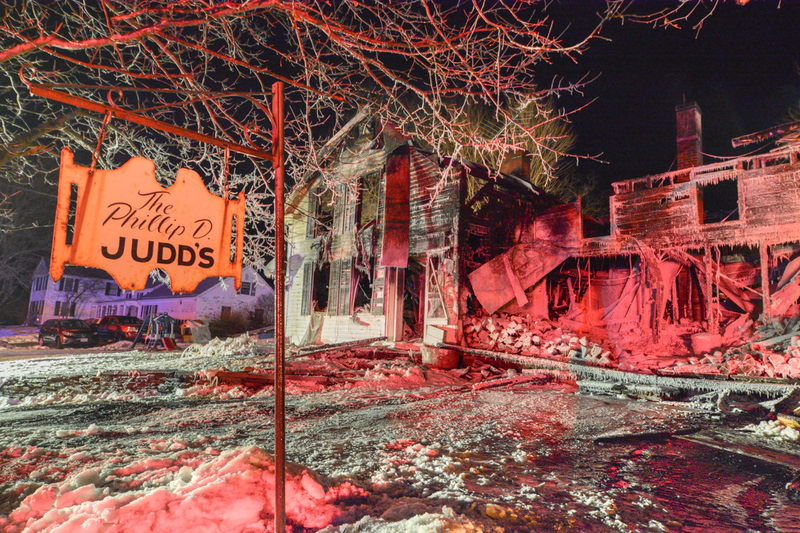 Over fifty firefighters from Ashfield, Buckland, Chesterfield, Cummington, Northampton, Plainfield, Westhampton, Williamsburg, Windsor and Worthington answered the mutual aid call for help. The MA Dept. 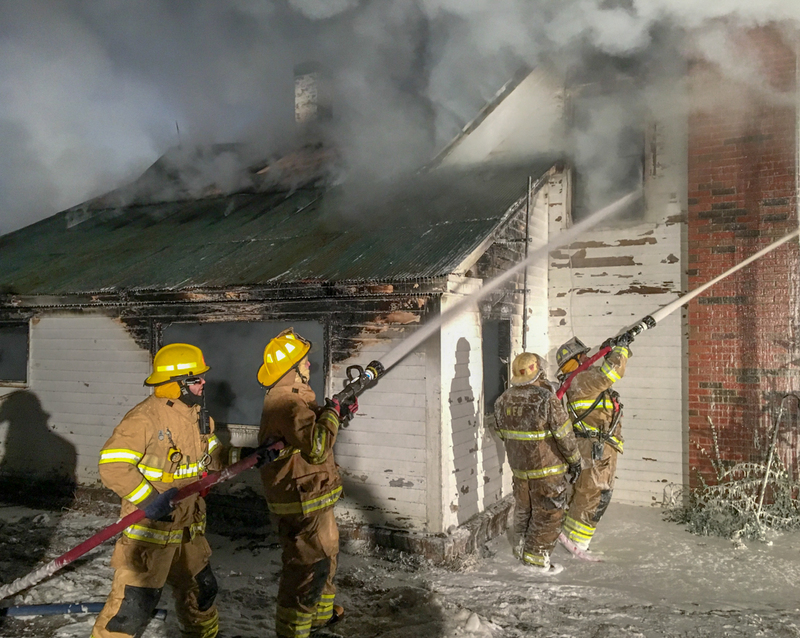 of Fire Services also supplied a rehab unit that offered crews a brief respite from operations in the form of hot beverages, light snacks and a place to warm up. Highland Ambulance personnel addressed injuries sustained by firefighters throughout the operation. Once the fire was brought under control, a crew from the Williamsburg fire department was able to make entry to the building and retrieve a wedding ring that had been placed in a container on the kitchen counter. As operations at the fire scene wound down, a bucket loader from the MA D.O.T. worked to scrape accumulated ice from the road surface in advance of the state highway being reopened to traffic. 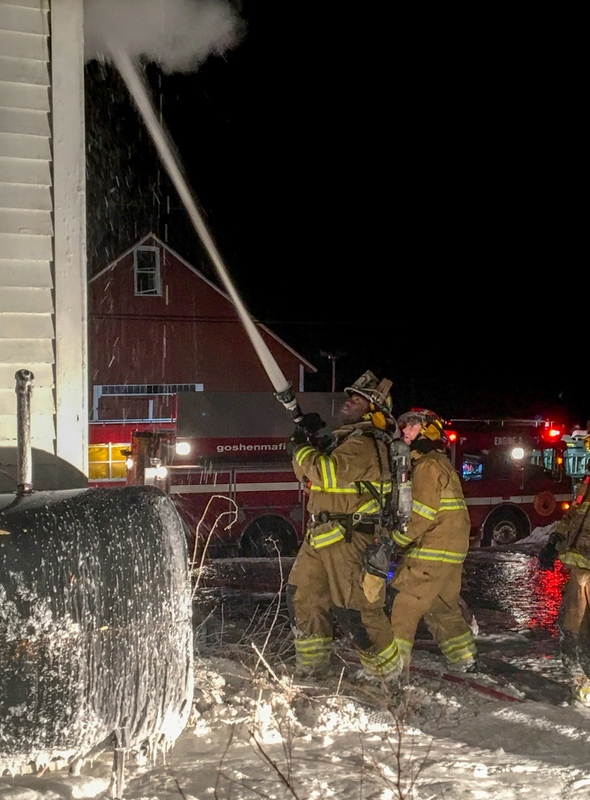 Fire crews returned to quarters around daybreak Saturday morning to lay out frozen hose, begin the process of washing our turnout gear and cleaned equipment so it could be put back in service. Early Saturday morning, a GoFundMe campaign was quickly established by Peggy Reinke (Jess Judd’s step-mother) to help defray the immediate costs of restoring normalcy to the Judd’s. In a show of support by the surrounding community, over $25,000 had been raised in less than 24 hours. A steady stream of cars made their way to the Goshen Congregational Church where Ashley Harrison (a friend of the Judd’s) coordinated donations of clothing, furniture, diapers, toys and gift cards with several other volunteers. Later in the day, the family was also able to arrange to move into the Tilton Town Farm house on Wing Hill Road in Goshen. In less than three hours, and much to the appreciation of Phil and Jess, family and friends were able to supply the once empty home with new mattresses, furniture, and a completely stocked refrigerator. The home, which was totally destroyed by the fire, was insured. 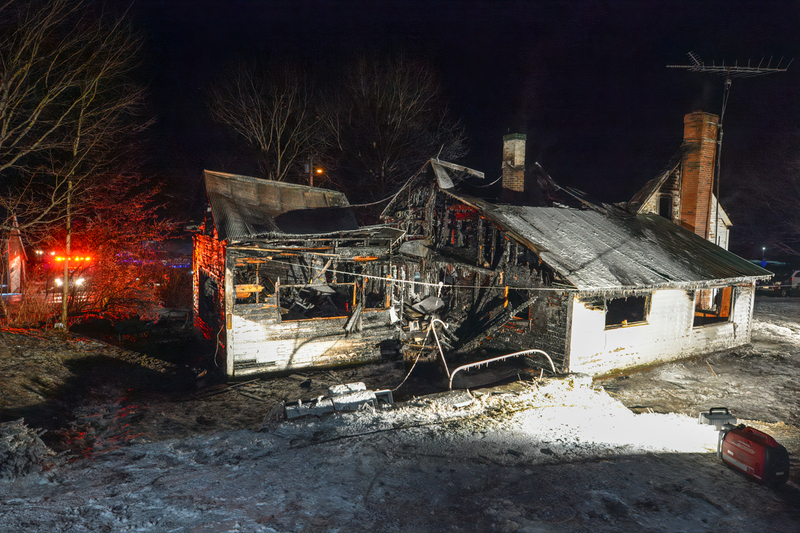 An insurance adjuster met with the family late on Saturday to begin the recovery process. A lot has happened in a very short period of time. Volunteers will continue to coordinate the collection of items once a better inventory of the family’s needs has been determined. Having met with Phil and Jess, they are overwhelmed with the amount of love and support that’s been shown by our community. 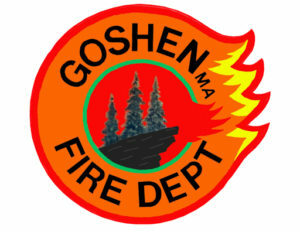 The Goshen Fire Department would like to extend their gratitude to all those who selflessly donated their time to answer the call for help. We’d also like to recognize the men and women at Northampton Control – our dispatchers. They’re an integral part of our team and couldn’t do what we do without their coordination efforts. This is what firefighters encountered shortly after arriving on scene. The roof of the front porch had already collapsed. 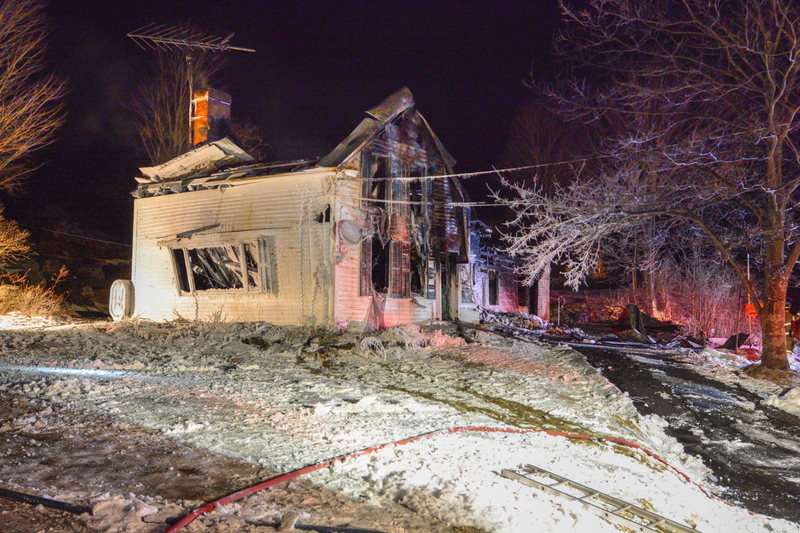 The front of the house was bathed in the red and blue lights of emergency vehicles parked on Route 9. The western or "B" side of the home. Williamsburg firefighters work to get water onto the second floor of the original section of the house. Water is directed through the second floor windows. Firefighters aim their hoses at the soffit on the "B" side of the house. 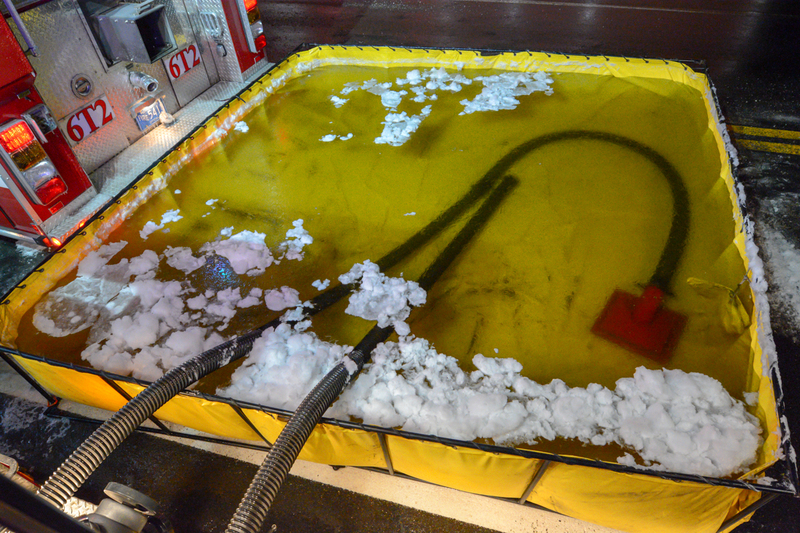 As fireground operations subsided, ice began to form on the surface of the water in this 3,000 gallon dump tank thanks to temperatures that hovered in the low to mid-teens. In spite of our best efforts, the house was destroyed by the fire. The "C" side or back of the home. The "C / D" corner of the building. The fire began around the wood stove which was hooked up to the smaller chimney in the center of the building. The "D" or eastern side of the building. The house was coated in a blanket of foam. Firewood can be seen stacked on the front porch of the home.